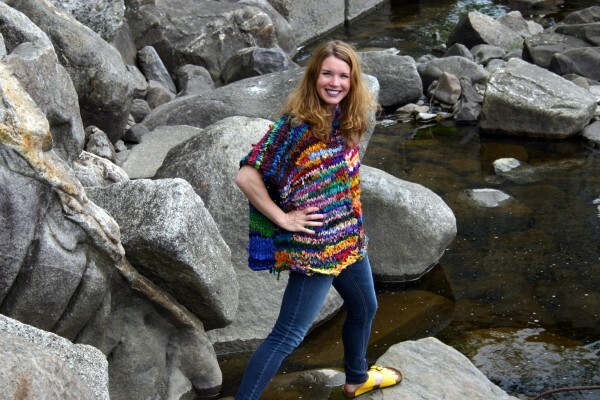 Nicole Snow, owner of Darn Good Yarn in Sebec, models a poncho she designed and made out of reclaimed silk ribbon. On Tuesday, Snow was announced as the winner of FedEx's inaugural Small Business Grant Competition and will receive $25,000 to expand her business. SEBEC, Maine — A 4-year-old yarn company in Sebec has been named the grand prize winner of FedEx’s inaugural Small Business Grant Competition. Darn Good Yarn, which Nicole Snow launched out of her Sebec home in 2008, will receive a $25,000 grant to invest in her business. The announcement was made on Tuesday. Snow, who just turned 30, said she’s still a little “shell-shocked” from the news. Snow, a former officer in the U.S. Air Force, imports yarn produced by women’s groups in Nepal and northern India — she said she has about 40,000 balls of yarn in her house at the moment. The majority of her business is wholesale and she has customers around the globe. Since her founding in 2008, her gross revenue has increased 1,500 percent, she said. She places her annual revenue between $100,000 and $400,000. Snow said she’ll use the $25,000 grant to expand her product line — she caters to knitters and crocheters, but will begin to target rug hookers and sewers — and to help Darn Good Yarn expand its international sales. The competition included roughly 4,000 businesses. People could vote on the business they wanted to win on a website FedEx developed for the competition. The top 100 businesses then were interviewed by FedEx officials before a winner was declared. Snow said she wouldn’t have had a chance without social media. Her business has more than 10,000 followers on Facebook, and she promoted the competition constantly to her fans on Twitter and Facebook. In the end, she got just shy of 5,700 votes. In a post-recession economy, she said it’s important for people to realize that they can be successful running a business from their home.